It's beginning to look a lot like Christmas, especially now that Caprice De Luca has wrapped up her holiday-themed staging gig at a stunning historic home in downtown Kismit, Pennsylvania. Behind all the red ribbon and glowing string lights, homeowners Chris and Sara Merriweather have it all. But Chris, a Vietnam vet who plays Santa every year at the community park, has been displaying strange behavior after a recent trip to Washington, D.C.
Slay Bells Ring by Karen Rose Smith is a 2017 Kensington publication. Caprice and her large Italian family are back to solve one of her most complex and emotional cases to date. Caprice is commissioned to stage a beautiful historic home, but the owners are split on the idea of selling the home. Chris, a toy maker, and the resident Santa Claus, is determined to sell the property, while his wife, Sara, is more reluctant, because the house holds so many memories for her. But, after exhibiting some rather odd behavior, Chris is found murdered. Why would anyone want to murder Chris? Well, it would seem he has more enemies than anyone thought possible, and he’s been holding back a few big secrets- I mean giant whoppers- and a few of them came tumbling out of the closet after his death, the consequences of which cast suspicion on several people almost immediately. With Caprice’s naturally detecting skills, she begins asking around in hopes of getting answers for a family in shock and mourning. 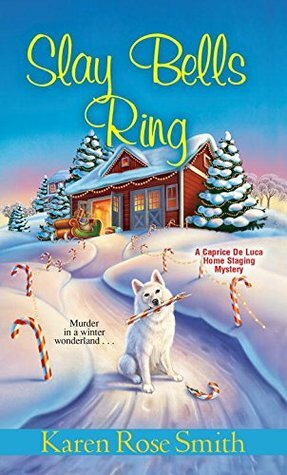 It’s been a while since I picked up a cozy mystery, and with the cool temperatures and the holidays right around the corner, I was in the mood to curl up with a nice, clean, whodunit. Naturally, I went straight for this book, since it is the latest installment of one of my 'go-to' cozy mystery series, plus this story has a few holiday elements included, as an added bonus. Not only that, I just finished a few dark and tense books and needed to wrap myself in the comfort of old book friends and the warmth of love and family this series always inspires. This story is a little emotional though, touching on the pain of war and its after effects, which can haunt people for decades. I also felt sympathy for the family, who suffered a great loss, but is realizing a new kind of hurt when they discover things about their loved ones that were kept hidden from them. Caprice works with the police a bit on this case, while doing a little matchmaking for her sister, in the process, so I’m hoping to see her skills get a little professional recognition one day. As always, I love touching base with Caprice and Grant, her close -knit family and all her wonderful pets. 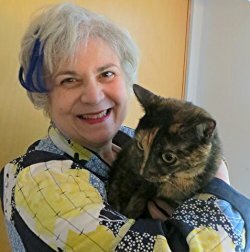 Caprice is fun, free spirited, sweet, dedicated and loyal, and I like her moral standards, and her love of animals, which is why this is one of my favorite cozy mystery series. Overall, this is another terrific installment in the Caprice De Luca series!! If you love cozy mysteries, pets, strong family elements, with a dash of romance, you will love this series.